This recipe is the perfect reviver after a run or coming out of a deep sleep. It is not a stuffy, authoritative and slimy health drink. It is vibrant, refreshing and very tasty, with many benefits. 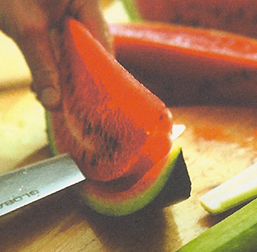 Cut the melon, cucumber and celery and put through a fruit and vegetable juicer (a food processor will do). Chop the mint fairly fine and add to the juice. Pour into glasses and sprinkle with flax seed.